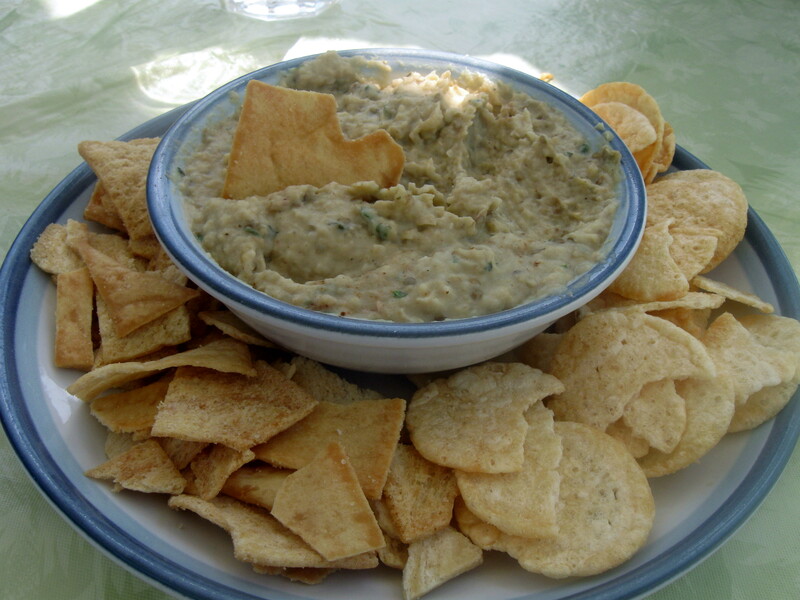 Dips are the ultimate convenience food; you don’t even need utensils. This one inspired by the Food Network goes well with cucumber slices or chips, and it’s hearty enough that you might forget about cooking dinner altogether. You can make this spicy with an extra shake of cayenne, or add more basil and lemon for a sharper flavor. Everyone around the (large) table seemed to like this dip, including the 3 year old. That’s success! Place eggplant on a cookie sheet, drizzle with olive oil, and roast at 400F for 20-30 minutes. Allow to cool. In a food processor, blend eggplant, 1/4 c. olive oil, beans, basil, lemon juice, and garlic. Season to taste with salt, pepper, and a dash of cayenne. I know at least some of you are very disappointed that the Patriots aren’t playing in the Superbowl. And I understand, but you still have to eat during the game, right? I saw these Pizza Pinwheels from Recipegirl and knew I had to make them – with my own twist of course. Her recipe makes it look easy, and even has step-by-step photos! There are so many possible variations on this recipe that my head was spinning. But for my first attempt, I decided to try a spinach-garlic flavor. The dough is pretty easy to work with, although I couldn’t roll it out quite as thin as intended. It’s also a little tricky to transfer the pinwheels onto the baking sheet, but it’s OK if a couple fall apart. The final product was still great; these pinwheels are both tasty and cute, which is exactly what you want for party food. I am going to try other versions, but I couldn’t wait to share this one. You might want to make a trial version of these before the big day. My only regret was not having homemade sauce ready for dipping, and I won’t make that mistake again. Sift together flour and sugar. Add yogurt, and stir until blended. Use your fingers if needed to mix the ingredients into a smooth dough. Knead briefly on a floured surface. Roll into a large 8″x12″ rectangle. Spread oil onto dough. Spread spinach on top of oil. Sprinkle 1/2 c. of cheese on top of spinach. Roll dough into a log. Cut into approximately 10 equal slices. Place each slice on a baking sheet coated with cooking spray or parchment paper. Sprinkle remaining cheese onto pinwheels. Bake at 350F for 20-24 minutes, until lightly browned. I took a field trip with a few friends to the Penzey’s spice store. (For local Boston readers, it’s on Mass Ave. in Arlington. For central CT readers, there’s a store in West Hartford center.) It’s a mecca of spices – row after row of little jars and bags. I could take in the scents all day! Santa had been good to me, and I didn’t really need to replenish any spices, but I did pick up a jar of their Chili 3000. It includes ancho chili powder, garlic, cumin, onion, cilantro, paprika, cayenne, lemon peel, Mexican oregano, black pepper, natural smoke flavor, and jalapeno pepper. Whew – that’s a lot of spice! I wanted to come right home and start whipping up a batch of chili, but I really had a lot in my refrigerator at that point. I also had some pita that were one short step away from stale, so I decided to whip up some pita chips instead! They came out really well, and I love the spice. I didn’t use a lot because I wasn’t sure how hot it would be, but it was totally fine. I can’t wait to make a pot of chili using the spice soon! In the meantime, making these pita chips was fun too. Spread a very thin layer of Smart Balance on each chip, and sprinkle seasoning. Bake at 400F for 7-8 minutes. Allow to cool for a few minutes before serving. There’s always too much food leftover from our Thanksgiving dinner. This year, we didn’t have a lot of leftover turkey but we were drowning in mashed potatoes. I saw these Baked Turkey Croquettes on Skinnytaste, and th0ught that would be a great way to use the turkey we had while making a dent in the mashed potato supply. The original recipe calls for making mashed potatoes, but of course I didn’t need to do that! I also substituted (leftover) white wine for chicken broth, and used the last of this summer’s parsley crop. They actually came together fairly quickly since the potatoes were already prepared. The croquettes were really good, especially when served with my sister’s (leftover) cranberry sauce. Even though they’re baked, they still get nice and crispy in the oven, and I like the flavor of the wine and parsley. This recipe transforms boring leftover mashed potatoes into something entirely new and tasty! Heat oil in a large pan. Saute garlic for 1 minute, until fragrant. Add onion, and saute for 15-20 minutes, until soft and golden brown. Add parsley and white wine, and simmer for 2-3 minutes. Add turkey and stir to combine. Taste and add more salt and pepper as needed. Place mashed potatoes in a large bowl. Add turkey mixture and mix well. With clean hands, form meatball-sized croquettes. When all croquettes are formed, dip each croquette in milk and roll in breadcrumbs, and place on a cookie sheet lined with parchment paper. Coat croquettes with cooking spray, and bake at 450F for 20-25 minutes, turning halfway through. As I mentioned yesterday, our supper club theme this month was ‘Pumpkin’. By the time I RSVP’d, we already had a menu that included a soup, salad, two main dishes, and dessert. So I decided to go for an appetizer, and found this recipe for Libyan Spicy Pumpkin Dip. A little research revealed that the dip is called cershi or tershi and was made by the Jewish community in Tripoli. If you’re interested in learning more about the culture, there’s a whole movie about The Last Jews of Libya. There are several versions of the recipe floating around the Internet, but they all call for pumpkin, garlic, and spices. My dip came out a little spicier than I intended, but I really liked it. It was good for scooping up with pita, and paired very nicely with a glass of white wine. If there’s dip leftover, it would also make a great spread for a veggie wrap. There’s no shortage of pumpkin this year, so pick up a can and give this recipe a try! Heat olive oil in a frying pan. Add onion and saute for 15-20 minutes, until soft and beginning to brown. Add garlic and saute for 1-2 minutes. Add pumpkin, spices, and tomato paste, and stir to combine. Add lemon juice, and stir again. Cook on low heat for 10 minutes, until dip is heated through. I bought a bag of baby carrots on sale last week. They’re great for a quick, crunchy snack and travel well. But I was getting a little bored of the carrots before the pound was gone. So I borrowed a trick from my nephews and decided it would be a lot more fun to dip them. I was inspired by this recipe which suggests toasting the spices prior to mixing them in the yogurt. After just a minute in the frying pan, the spices were very fragrant which was a nice touch. The dip is both spicy and delicious! It was great with carrots, but you could also dip other vegetables or even pita bread. I would use Greek yogurt next time to make it thicker, but otherwise wouldn’t change a thing. Mix spices in a bowl, and place in a small preheated frying pan. Cook for 1 minute, stirring frequently, and then remove from pan. Mix toasted spices, lime juice, and yogurt in a small bowl. Along with the Zucchini Cheddar Biscuits, I also brought this Chunky Blue Cheese and Yogurt Dip to the dinner party. You may remember I made a Stilton Walnut Dip over the winter; I thought this version would be a bit lighter for summer. I tend to prefer dips that have a varied texture, so I didn’t put the ingredients in a food processor and just mixed them in a bowl instead. Although the dip tasted fairly sharp at first, the flavor quickly mellowed. I served the dip with carrots and Triscuits, both of which complemented the taste well. However, the dip ended up having a fairly thin consistency. Next time I would add some sour cream or perhaps more cheese to make it thicker. But there’s something about any blue cheese dip that always makes me go back for just one more scoop. Mix all ingredients in a bowl. Allow to chill for at least 2 hours.